As I’ve mentioned in a previous post it is quite easy to take your Windows Mobile widget and convert it into a Windows Vista/Windows 7 gadget. 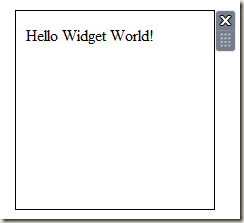 In this post I’ll take the Hello World widget I built in the Getting Started and Start Menu Icons posts and walk through converting it into a gadget. Gadgets are almost identical in structure to widgets, with one exception. Instead of a config.xml manifest file, gadgets use a gadget.xml file. 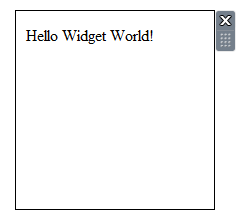 So, the first step in converting your widget is to add a gadget.xml file to your project. Here is a sample file that mirrors the information I used in the config.xml file for the widget. This build file now makes use of a file called gadget_files.txt which contains the file specific to building the gadget (ie includes gadget.xml and not config.xml). This happens because the gadget dynamically sizes to fit the content, which means that if you don’t specify a height or width for the gadget you get very minimal space allocated to it. This is simply fixed by adding size information to the body tag of the Main.htm file. And there you have it – your widget is running as a gadget. Now there are some additional features of gadgets that we aren’t using here but I’ll come back to them as we get into adding more functionality to the widget.